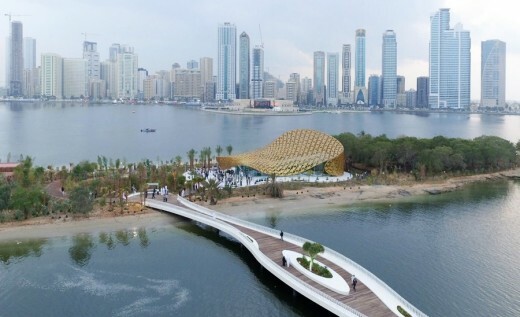 On Noor Island, a lagoon island in the middle of the capital of the Arab Emirate Sharjah, German design studio 3deluxe is currently designing a 2.5 ha transmedia landscape park, interwoven with an ensemble of several themed pavilions and buildings. The architectural structure to shape the island’s entire appearance, the Butterfly Pavilion, is nearing completion. The park will open in mid-December and further attractions will be continually added in the course of the coming weeks and months. The most striking building on Noor Island is the high-profile Butterfly Pavilion, whose ornamental shading roof characterizes the island. It houses more than 500 butterflies in a unique biosphere and offers visitors numerous opportunities for contemplation and recreation. 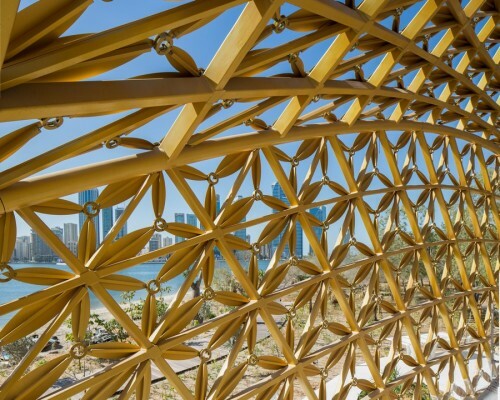 The shape and design of the pavilion’s biomorphic outer shell are the product of an intense formal exploration of parametric design strategies in dialog with traditional Arabian ornamentation. The highly complex freeform roof is composed of a load-bearing 3D frame with over 4,000 golden aluminum leaves of varying sizes. In the Butterfly Pavilion, 3deluxe is realizing its design principle of multilayered atmospheres: In material and mood layers, natural and artificial levels blend into a visually and emotionally condensed overall picture. Technology and nature, light and shadow, modern and traditional architecture fuse into a complex spatial experience. 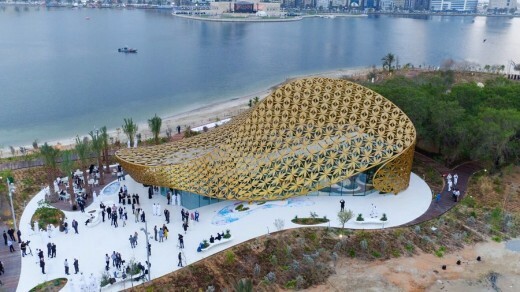 The Butterfly Pavilion is the icon design element of Noor Island. Together with numerous installations and small structures, light and media objects, unusual plants and a musical soundscape it gives rise to a holistic, multisensory experience. In designing Noor Island Park 3deluxe took on the exciting challenge of sounding out new urban spaces and giving residents the opportunity to explore their city intellectually, emotionally and physically. The overall project, which is being realized on behalf of the state development board Shurooq and project initiator André Heller, gave the architects at 3deluxe the opportunity to develop and implement transdisciplinary design ideas without being restricted by purely functional and profit-based considerations. The design combines a wealth of aesthetic stylistic elements in an interdisciplinary architectural language that spans space and cultures. 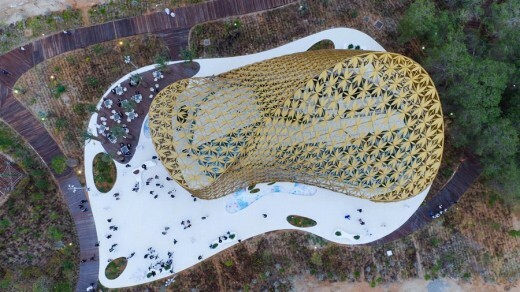 The Butterfly Pavilion’s shading roof is not only designed to be formally defining; it also serves to regulate the climate without putting a visual emphasis on the fact. Indeed, in addition to the shading it provides, the geometry actively supports the chimney effect, which funnels hot air over the roof and façade, while the water pools act as humidifiers, cooling inflowing air. The shape of the roof, which at some points is a full 13m high, reaches immense horizontal spans across a surface of some 800m². Three interlocking freeform sections serve to counterbalance each other and thus lend the overall form greater stability. As a result, the roof as a whole remains strikingly delicate, with only a 200mm thick support structure required. The entire structure rests on only 9 points and three pillars that like a tree trunk taper upwards while branching outwards. The entire roof structure was prefabricated and then simply assembled on site. The individual roof elements are fastened by means of intelligent node connectors that are able to combine in a single connector all the different connection angles of the inter-related roof elements. Integrated into the nodes are LED dots that can be controlled individually, whereby the switches and power supply are hidden away inside the structure itself. In the evening hours, the LED dots give the building a theatrical note: softly flowing preprogrammed light patterns bring to mind swarms, motion and butterflies, thus emphasizing the isle’s meditative character. One special challenge was to develop a high-gloss gold paint that could withstand the maritime environment: the salty air, the high temperatures, the intense UV radiation and the mechanic impact of sandstorms. The special painting techniques also had to be customized specifically for the three different surfaces and application techniques to ensure that the color remained the same throughout. Wet paint was used for the steel components, powder paint chosen for the molded parts, and anodized onto the aluminum elements. The last coat was applied locally after the roof had been erected. Beneath the Butterfly Pavilion’s shady golden roof is a glass cube: the polygonal pavilion is an artificial ecosystem, and its rainforest biotope – populated with countless butterflies – is housed inside a sealed climate skin. The biosphere’s steel structure is clad with a transparent gleaming façade, boasting organically shaped skylights that offer views out and into the roof structure. The light that enters and the shadows this creates, define the mood inside the biotope as if they were a leafy tropical canopy. The rainforest biotope covers 230m² and boasts a spectacular landscape. Islands of tropical plants are embedded in a white 3D-modeled surface with an ornamental print that extends seamlessly across the entire floor and the walls. The custom-made 3D puzzle made of thermoformed KRION®, a mineral material, is covered with a special sublimation print, whereby no patterns repeat – it emulates the ornamental face of the roof. Over 500 exotic butterflies thrive in this biosphere, which is as artificial as it is natural, and can be observed during all stages of their development. A modern food lounge is located in the midst of the biosphere’s thriving focused atmosphere, which takes its cue from a water lily. A light sculpture hovers above the seating area at the heart of the café – made of light, white fabric bands. The lounge area is structured by dividing walls that resemble petals fallen to earth, and set the comfortable furniture off visually from the rest of the space without sealing it off. The interior is primarily treated in white and, compared to the outside world, is pleasantly cool, promising relief from the outside heat. The floor, covered in liquid glass with an ornamental print, creates an eye catching effect. After sunset, the direction of the lighting changes round, and the mood set by the sculpture beneath the ceiling transforms the space into a place of contemplation, the playful lighting now radiating through the ornamental, golden roof to the outside.